West Highland Yachting Week is one of those rare regattas that moves from centre to centre during the event. This creates enormous logistical difficulties for the organisers, but provides an ever-changing scene, both ashore and afloat, for competitors. Feeder Races are offered from Largs to Ardrishaig on the Friday, and from Gigha and Oban on Saturday morning, to bring the fleet to Craobh for the start of the Series races. On Sunday, with the whole fleet now gathered together, there will be racing in lower Loch Melfort, Loch Shuna and South of Loch Shuna, and on Monday all will race up to Oban, which will be the base until Wednesday morning. Here the fleet splits up in the evenings, taking up moorings or anchoring off the Esplanade, off Oban Sailing Club, or at one of the local marinas – Oban Marina across the bay at Ardentrive, or Dunstaffnage Marina just north of Oban. Supermarkets, chandleries and plenty of other shops, together with a wide choice of hotels, pubs and restaurants are to be found in Oban. The race on Wednesday up to Tobermory is always a challenge with fickle winds and tides, and where even local knowledge doesn’t prevent yachts from “falling into holes” and having to watch others sailing by on the other side of the Sound. Then there is the rush to get into Tobermory Harbour to get a mooring, pontoon berth or the best spot to anchor – nearest to the hostelries! Tobermory, one of the most visually attractive harbours anywhere, always provides a great welcome for the fleet, and the view from the upper levels of the town across the bay, with the whole fleet at anchor, is a fine sight. 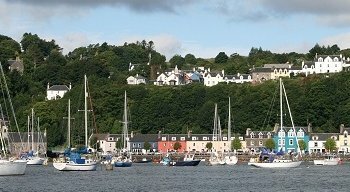 Tobermory provides a small but excellent collection of shops, pubs and eating establishments, and can supply most needs. After two nights in Tobermory, the fleet races back down the Sound of Mull, hoping for a good breeze to get them through the channel between Duart Point and Lismore before the change of tide necessitates a shortened course. Yachts then come back into Oban Bay for the final night’s celebrations. The week will see yachts passing many miles of different coastline. They will see great numbers of islands, mountains, lochs, castles and wildlife, all providing a spectacular backdrop to the close and varied racing.